This easy Fresh Hot Jalapeno Relish recipe is packed with some major heat and full of an incredible flavor. Calling out all jalapeño and garlic lovers…. I have the relish for you! This Fresh Hot Jalapeño Relish is the perfect condiment for all types of food from hotdogs, hamburgers, chicken, sweet potatoes, potatoes, and if you are brave, chips! It is also Paleo and Whole 30 approved! 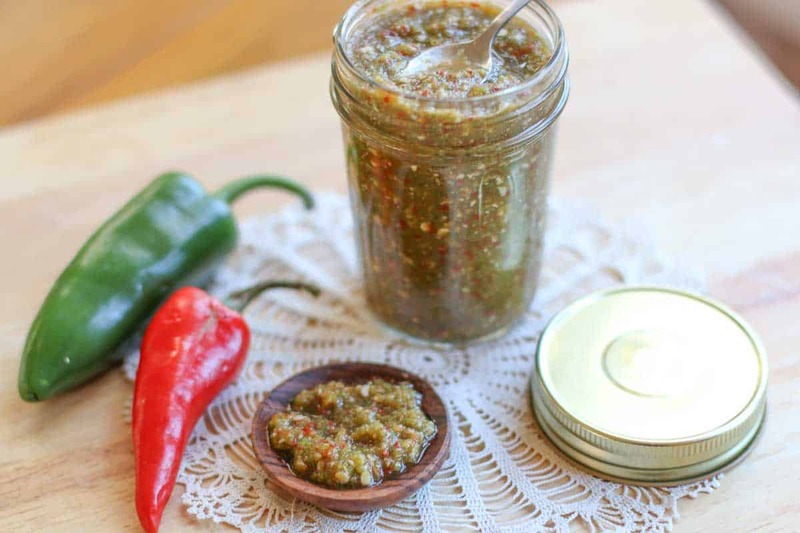 Warning: If you make and eat this Jalapeño Relish your mouth will be on fire! You may break out with small beads of sweat on your forehead and upper lip. But that won’t stop you from taking another bite. This jalapeño and garlic relish’s flavor becomes highly addictive and you will soon find yourself topping it on EVERYTHING! To make; just throw everything in a food processor and done! to make this. I absolutely love it. It is one of my favorite gadgets in the kitchen.) How easy is that? It is best if you refrigerate for three days before serving. This allows the Fresh Hot Jalapeño and Garlic Relish to come to full flavor. It never makes it to the third day in our house if my daughter finds it in the refrigerator. She loves this stuff. She will take tiny spoonfuls and put it on everything…. 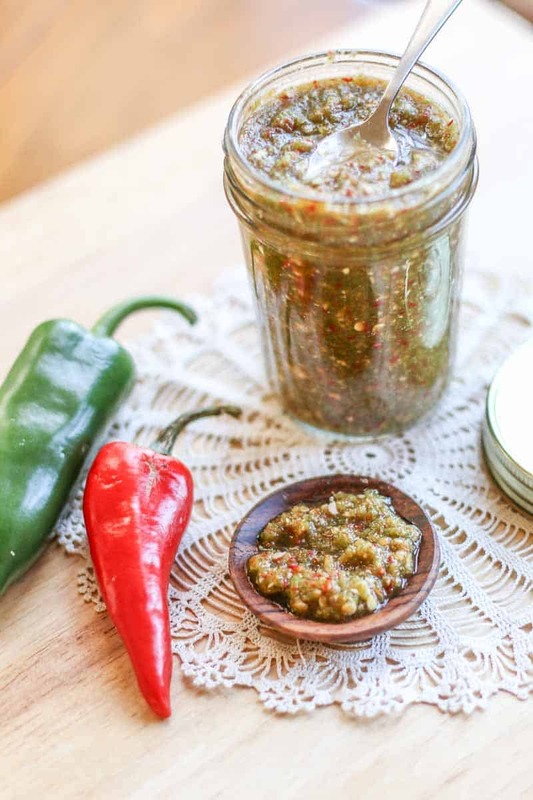 This Jalapeño relish makes a great condiment to keep you healthy. Everything is fresh, tasty, low carb and low calorie. So if you like garlic and if you like hot peppers…. Give this a try! 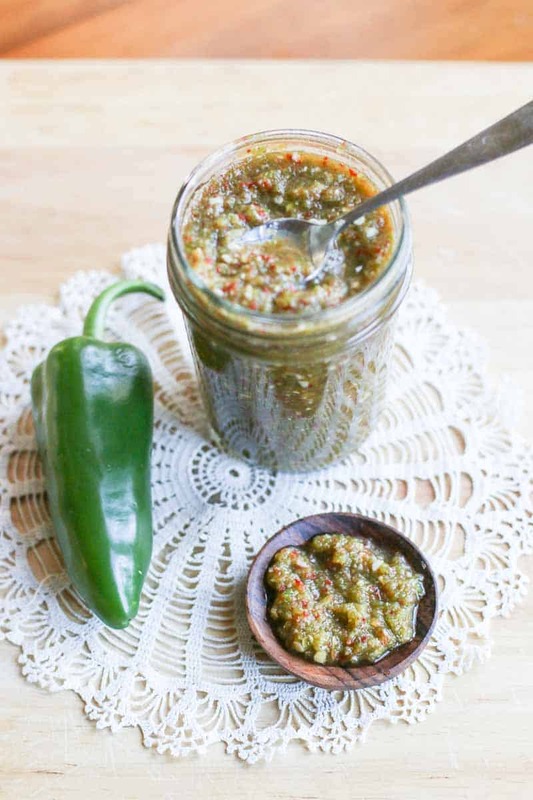 *Cooking Note: This jalapeño relish recipe is meant to be hot. Keep the seeds. It will not taste the same without the seeds. For a milder version, use only jalapeños. If you like this recipe, check out: Sofrito, Jalapeño Cilantro Hummus, and 5 Minute Restaurant Style Salsa. This Jalapeno Relish makes a great condiment for all types of food from hotdogs, hamburgers, chicken, sweet potatoes, potatoes, and if you are brave, chips! It is also Paleo and Whole 30 approved! Cut off stems on peppers and discard stems. Throw all ingredients in a food processor and pulse until a finely paste texture. Refrigerate in an airtight container for three days, then serve. I would believe you can can this relish… but I am not sure. I am not positive I have the exact acid ratio for preservation… However, it should a long time in the refrigerator; maybe up to a month. Could this recipe be canned? If so can you ptovide the recipe/instructions to do so? Thank you so much Judi for letting me know! I am so GLAD you enjoyed it!! You made my day!! I made this and used a lot of hot peppers from the garden. We love it! We had it on tacos and I have cooked it in sauces. I just put it on Jasmine rice with grated Mexican cheese! A new rice dish, so delicious! Thank you for sharing your recipe. Nice recipe.. great blog with delicious recipes. I honestly am not sure. I wish I knew. I have only canned jelly, so I am unsure of the correct acid ratio to can this to not spoil. I am sorry. It should last a couple of weeks with refrigeration. It never lasts more than a few days in my home. We top it on everything like we would a hot sauce or salsa. It is just very hot. How did you alter this recipe to can? It should be good for about 1 week refrigerated, maybe longer. However, if you freeze it, it will become watery. If you are using it as a spice in cooking, that won’t matter much. But if you are using it as a relish, it won’t be an optimal result. It would be the same as freezing fresh salsa.. I have to try this. Does this freeze well so it can be saved in smaller portions? One more thing, might I suggest you make and freeze it for easy use. These type of sauces freeze really well. You would either need to add a large amount of vinegar or use a pressure canner to avoid the dangers of botulism and other food borne bacterium. That’s the problem with wanting to can certain recipes, adding so much vinegar changes the product completely and most people don’t have access to or know how to use pressure canners. Just made and tasted- amazing!! Doubled the recipe and canning in jelly jars- it is that good! We went right to taste testing on crackers. Can’t wait to try it on eggs, breakfast sandwiches, on cream cheese and crackers, so many ideas!! Thanks??? I honestly couldn’t tell you. I have only canned jelly and pickles. I don’t know enough about canning to give you a safe answer. I am sorry. I would like to can this, what do you think I would need to do to adjust this to be able to can some? At least 2 weeks, but I am not sure how much longer…. How long do you think this will this last in the refrigerator? So excited for hot peppers from the garden this summer so I can make this delicious spicy relish! Ooooo. This looks so delicious! I love hot stuff, my husband doesn’t but you know what that means? I get it all for myself!! Wehaw! The relish look incredible. I can imagine putting this on every food I eat. So spicy and yummy! Sounds like quite the hot and zesty relish. If you love HOT you will love this!! Slap yo’ Momma! This sounds so good – I’m addicted to spicy foods. Love the blend of peppers! Oh Katie, I think you have me again!! This is going into my salsas rotation!